That's not to say that this reading is 100% calm and inner-peace. It builds to an energizing crescendo with the Knight of Wands, a card that inspires us to charge into our future with creative zest. A nice mix if there ever was one. So what do these cards have to tell us? Rest, re-calibration, and re-connecting to the source are of the utmost importance for us in the coming days. The Star is one of those cards that invites us to refocus on ourselves. We may have some baggage around the idea. How often are we told that putting ourselves first is selfish? This accusation gets thrown about so frequently that it actually points towards the radical nature of valuing and centering around our own experiences. What happens when we choose to pursue a balanced life? When our inner experience dictates our outwards actions? When we value our own rhythms, desires, and needs? Doing these things, it turns out, allows us to know ourselves better. And when we know ourselves better, we come face to face with our own power, desires, and motivation. It makes us powerful, and that can threaten the status quo. If we've been feeling creatively stymied lately and stretched too thin, The Star is pointing us inwards to regain our strength and re-orient ourselves to our inner compass. Don't worry if this isn't resoundingly clear. What if we don't know what our inner compass looks like, let alone where it points? It turns out that none of us do 100% of the time. Never mind the wildness of modern life and other people, our own inner landscape is constantly shifting and changing. The good news? It's ours to explore and value. This week we're being encouraged to take space for ourselves, lavish our own feelings, thoughts, and desires with attention, curiosity, and care. A key component of this card is detaching from outcome: plans, productivity, goals, ideas of what is and what isn't. Immersing ourselves in self-care in however that manifests for each of us is inviting in a special kind of knowledge. See that cute, odd bird perched on the tree behind the central figure in The Star? This delightful creature represents knowledge. 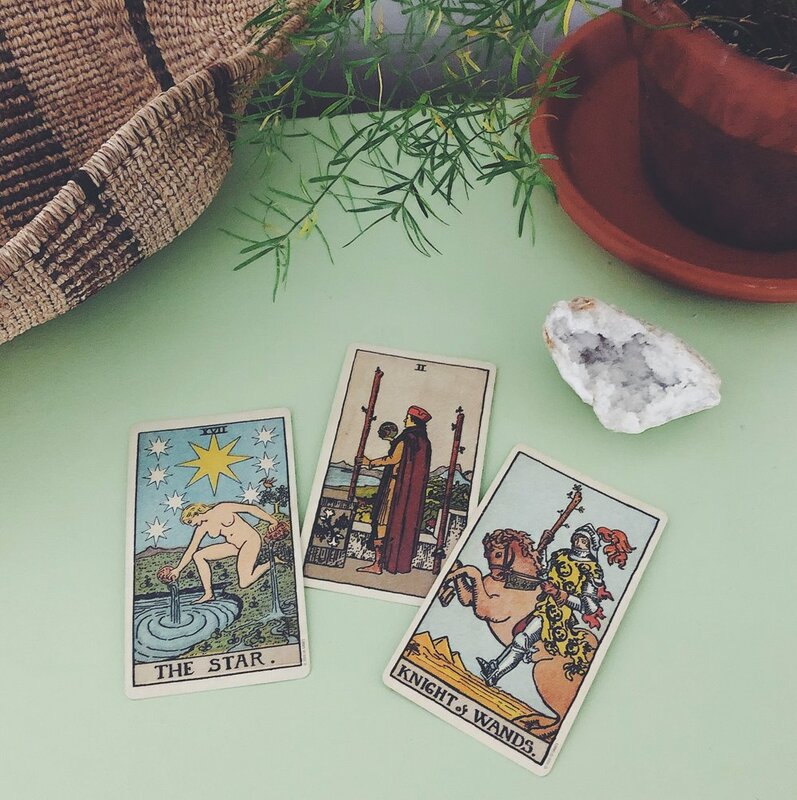 While we're focused on connecting to our source, dipping our toes into the healing pool of our intuition while being sure to feed back into it, the breakthrough and information we've been seeking with so much effort is naturally fluttering into focus. Let yourself step back from the pressure of seeking and create space in your life. You can give yourself the gift of time and attention, even if it's in small bites, and doing so is actually far more effective in gaining clarity than muscling your way though it all with forceful diligence. Paying attention to the little things is reigniting our creative sparks. It starts out as a slow burn with the Two of Wands as we begin to dream about changes, adventures, and new possibilities. Doing our Star work, however, is allowing us to rejuvenate and feel empowered, zesty, and capable. Soon enough, what seemed impossible, out of reach, or ill-defined, comes into blaring focus. It's the swashbuckling Knight of Wands entering into the picture! With him comes ambition, energy, and focus, though we'd be wise to make sure that it's all in service of The Star. Otherwise we'll burn out and run straight into the same patterns we were experiencing before. This week is a time to take a deep breath, center around yourself, and feel encouraged to block out all the rest. Know that doing so is valuing your energy and experience, not being selfish or cruel. When we act from our true sense of self we're able to bring our best into every situation, relationship, and venture. Now that's truly and genuinely inspiring.